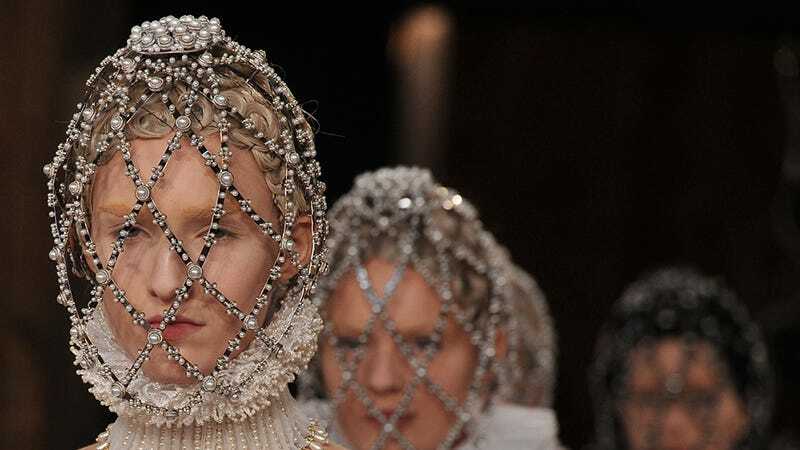 It was staggeringly beautiful and everything was encrusted in pearls - white gloves that only covered the fingers, extensively pleated or festooned collars that turned essentially into caged crinolines for the face and elaborate costume gowns that it really wouldn't have been a surprise to look up and see one of Henry VIII's wives taking a turn in, such was the fashion fantasy so incredibly re-enacted. Anglophiles, dreamers, ladies-in-waiting, pseudo-princesses and queen bees: This one's for you. Imagine Catherine Middleton, Duchess of Cambridge, in this?